Doctor Who: Revisiting SURVIVAL | Warped Factor - Words in the Key of Geek. Survival has gone down in Who history as the last episode of even reasonably contiguous Who from the Classic era, the last note of a melody that had run more or less continuously through the heart of Britain’s children from 1963 to 1989. Let’s deliberately forget all that misty-eyed malarkey and look at Survival as a story, because in a mark of unparalleled irony, when it went out, Survival looked like the capstone on a second really strong season of Doctor Who, as though it would mark a high point from which the fightback against scheduling hell would push on, and the show would continue to prove its artistic and economic worth. Since the start of Season 25, with Ben Aaronovitch’s barnstorming Remembrance of the Daleks, something had clicked with Sylvester McCoy and the character of the Doctor – stripped entirely of the original intention, (which it seems comical to recall was to create a less violent, more funny Doctor), and allowed to play the Doctor as a darker, more taciturn high-stakes game-player, McCoy’s Seventh Doctor was developing into something stronger in his own quiet way than had been seen since the days of Tom Baker’s powerhouse bluster. Certainly, Season 26 had barely put a foot wrong – Battlefield marked a highly notable improvement in the special effects for which Who was known (check out The Destroyer! 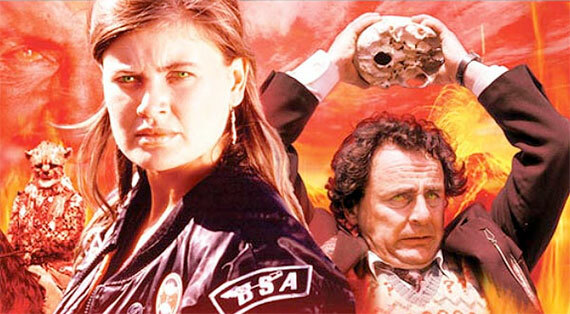 ), as well as bringing back UNIT in an invigorated way; Ghost Light had delivered an entirely weird but deeply unnerving gothic horror space story, and a strange companion piece to The Daemons; The Curse of Fenric had delivered powerhouse acting and a complex script that gave real depth to Sophie Aldred’s Ace character, and dared for one of the first times in history to show the companion being aware of the power of her sexuality as a potential distraction. This was Who challenging its own limitations, its own pre-conceptions, and filling the screen with ideas, even if, in cases like Ghost Light and Fenric, sometimes the wealth of ideas came at the cost of slightly compromised storytelling. Survival was the third successive story to challenge Ace and force her to develop – where Ghost Light made her confront her past and her fears, and Fenric made her confront her pre-conceptions, her hatred and her cast iron faith in the Doctor, Survival was to test how far she had come by taking her home to her old stomping ground, most likely as a way of testing whether she felt at home with those people any more, or whether she was ready to embark on a new destiny (it’s no secret these days that Season 27 would have seen her story arc end by being taken to Gallifrey and turned into a Time Lord, which would have meant severing ties with the places and people of her upbringing). So how does Survival stand up? With hindsight, like a better story than the budget would allow. Rona Munro was a solidly feminist playwright, and it was something of a coup to get her to write a Who story (and also, facing facts, a welcome breath of fresh air, given Who’s reputation as something of a boy’s club). Her story of cats and kitlings is all sorts of things hiding just beneath the surface. At its most simple level, there’s not a cat-owner alive that hasn’t suspected that when their back is turned, the cat is disappearing through space and time on adventures of its own (or if there is, they have spectacularly little imagination). Secondly, the idea of a catflap between times and places can be seen in any number of ways – either in terms of a science fiction innovation or in terms of a social one: any species that can determine a clear need can find a way to get to where it needs to be. Most particularly of course, there’s the idea of violence as a kind of destructive, self-perpetuating disease – ‘if we fight like animals, we’ll die like animals!’, the transformation of humans (and indeed Time Lords) into Cheetah People acting as an analogue of the effect of violence, the need to ‘survive’ eventually and ironically overwhelming the higher, more civilized and intellectual impulses, and subsuming everything else to the need to kill or be killed. There’s a degree to which this could be said to be a feminist argument, but Munro’s a better writer than to belabour this point, in fact giving one of the key roles to a promising young actress named Lisa Bowerman, who stars as Cheetah Person Karra (and has since gone on to immortalize herself in the world of Who at Big Finish as both a companion to the Seventh Doctor – meeting Ace along the way as Professor Bernice Summerfield – and to Jago & Litefoot as Ellie Higson, besides carving out a highly successful career as a director of Who audio plays). Survival demands violence irrespective of gender, Munro shows us, yet violence ultimately begets destruction. There has to be a point where you let the primal need go and evolve, or you die. The setting of the story in 80s Perivale among Ace’s friends is fascinating mostly because once they’d left their home to go travelling with the Doctor, it was staggeringly rare in 1989 that we ever went back home to see that environment again – (it had been done with Tegan in a very tangential way, and then not since Jo Grant in the stay-at-home Pertwee years) - another mark of the investment the Production Team at the time were making in giving Who a more realistic and deeper character angle than it had generally had in the past. And there are political notes in Survival too – Ace’s friends are mostly unemployed at the height of Thatcher’s Britain, seeming for the most part fairly listless unless faced with demanding challenges. Julian Holloway’s Patterson shows the flipside of the coin, the side that believed in much of the Thatcher ideology that self-reliance and self-defence are the only way to ensure survival and respect. It’s a gently satirical note that the tough man is hopelessly out of his depth on the planet of the Cheetah People. And then, in among all the parables of violence and intelligence, or survival or destruction, there’s the Master. He has, to be fair, absolutely no real place in the story, but Munro, informed of the need to have him in it, renders Ainley’s Master in the most rounded way since Logopolis –scenes where the Master is alone with himself allows us to see the potential that Ainley had, and brought to the role whenever he could, a potential that could see him stand as an equal to Roger Delgado’s definitive original. While the ending of Survival feels a little rushed and garbled, it gives McCoy’s Seventh Doctor and Ainley’s Master one of the most rough-and-tumble physical confrontations since at least The King’s Demons, and both actors give it their all, so the desperation to escape comes screaming off the screen, their fundamentally opposite worldviews clashing in primary colours in what could have been the last moments of their lives. There’s talk of course that Survival got almost everything right for the show’s ‘revival’ – but this is largely the product of New Who essentially taking all the good ideas that are in it, tweaking them to its own ends, and giving us a version of Who that took ordinary London girl Rose Tyler into time and space, popping back and forth to maintain her family ties. Season 27 had no plans to continue in Survival’s vein – indeed, it would have dropped Ace off on Gallifrey and carried on with the Doctor’s next companion being an aristocratic cat burglar. And of course, you can’t discuss Survival without discussing the Cheetah People costumes and the creepily unrealistic animatronic kitling. Budgets being budgets and cats being the unpredictable creatures that they are though, the only reason people fixate on the kitling is that it drops them out of the drama, in a way which things like Battlefield’s Destroyer had begun to teach them they didn’t need to accept. They were a momentary effects downfall in a season that had seriously rediscovered its storytelling mojo, and a story that managed to blend all the ideas and themes of stories like Ghost Light and Fenric with some more solid, more effective storytelling, meaning the story’s through-line built up to a pinnacle of pressure in the final battle between the Doctor and the Master, and in Ace’s decision that ‘Home’ actually meant the Tardis – the choice she was probably taken home to face. 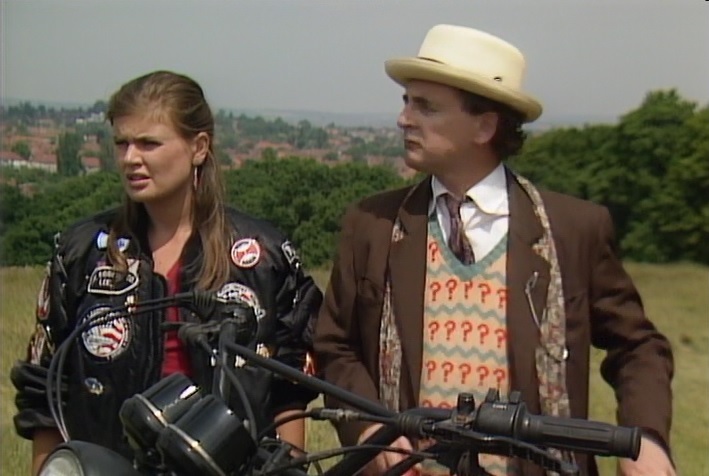 When the Doctor and Ace stroll ‘home’ towards the Tardis, and the overdub delivers one of Sylvester McCoy’s best speeches about the life of the Doctor, a bookend to his ‘days like crazy paving’ speech to Mel in Dragonfire, it leaves the future magnificently open, the story of the Doctor and his friend alive to the imagination of the fans.